Senior Coach – West Coast Eagles. 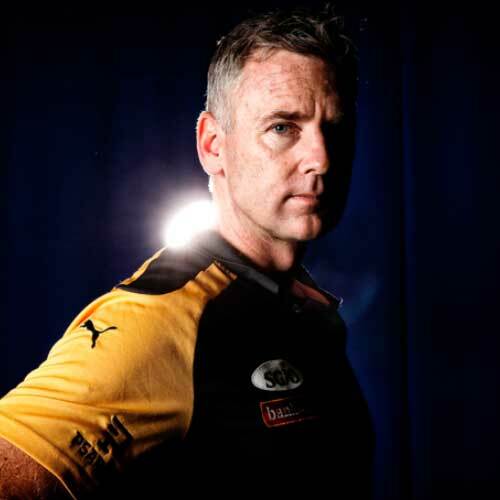 Senior Coach of the West Coast Eagles, Adam Simpson is a well known name in the AFL having played over 300 games for North Melbourne Football Club before retiring and transitioning into the world of coaching. A Melbourne boy, Adam played junior football for Eltham and the Northern Knights before being recruited to North Melbourne in the 1993 National Draft. The left footed midfielder made his debut during the 1995 season and won a premiership the following year, during which he was also nominated for the AFL Rising Star Award. Another premiership followed in 1999 and in 2002 when Adam was named in the All-Australian team and also won North Melbourne’s best and fairest award, the Syd Barker Medal. He was appointed Club Captain in 2004 and held the position until stepping down at the end of the 2008 season, with his span as captain including a preliminary final in 2007. Adam played his 300th game in 2009, the third North Melbourne player to do so, and finished his career towards the end of the season. Adam worked as an assistant coach at Hawthorn from 2009 – 2013 and played a leading role in the Hawks the 2013 Premiership. Adam was appointed Senior Coach of the West Coast Eagles at the end of 2013 taking over from long standing coach John Worsfold. In his first year as senior coach, the Eagles finished ninth. The following year, Adam and the Eagles surprised many with their performance when the club finished second at the end of the home and away season. The team went on to play in the 2015 AFL Grand final and the semi-final in 2016 and 2017 respectively. In 2018, Adam coached the Eagles to their second Grand Final appearance in four seasons which resulted in the Club’s fourth Premiership victory. The game was arguably one of the best AFL Grand Finals in recent decades going down to the wire with the Eagles ultimately snatching victory from Collinwood in the closing minutes of the game. Adam’s on-field experience, leadership and strong determination make him an excellent role model for athletes of all ages. Corporate functions and boardroom presentations.